Shishito peppers are small sweet Japanese peppers. They are perfect for sautéing or roasting whole with pretty much any flavors you like. Since these peppers are Japanese, I decided to go with an Asian marinade which is a really obvious approach but whatever, stop judging me. Ok, let's discuss the ingredients. The gochujang (Korean red pepper paste, which I found at Sprouts but it's available at most Asian grocers) is essential in my opinion. You could use twice as much soy sauce if you don't want to use (or buy) fish sauce. Otherwise, I feel like the rest of the ingredients play an important part in the marinade. Oh and don't forget the sesame oil! It's soooo good. I would wear it as perfume if it wouldn't make my husband throw up all over me. In addition to these condiments, add a little freshness by way of a little garlic, ginger and fresh lime juice. Combine everything together in a bowl and then rinse and drain the shishito peppers and place them in a large bowl. Sauté until the peppers have slightly charred. Place them in a bowl and sprinkle on some sesame seeds for good measure. Combine all the ingredients, except for the peppers, into a bowl and whisk to combine. This will be your marinade/sauce. 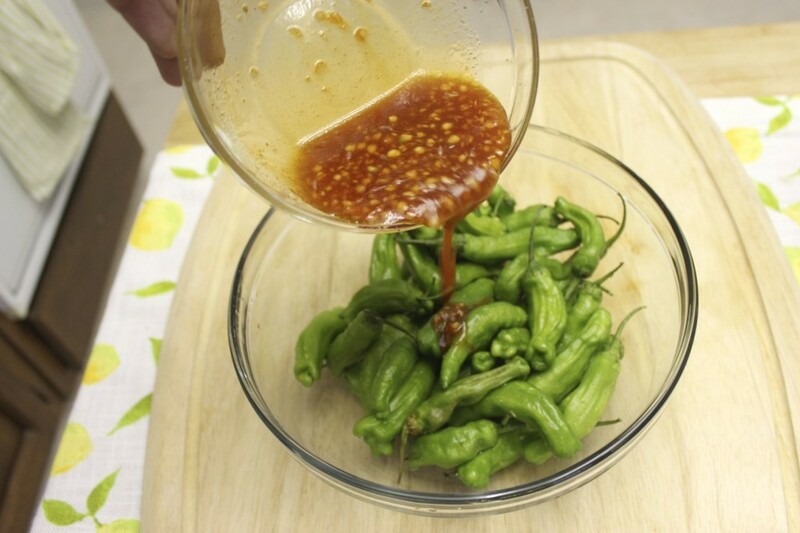 Rinse and drain the shisito peppers then add to the marinade and stir to combine. Heat a little oil in a large skillet on medium/high. Add the peppers and the marinade to the skillet and cook until the peppers have charred a little and the sauce has thickened. Place in a bowl and garnish with sesame seeds.